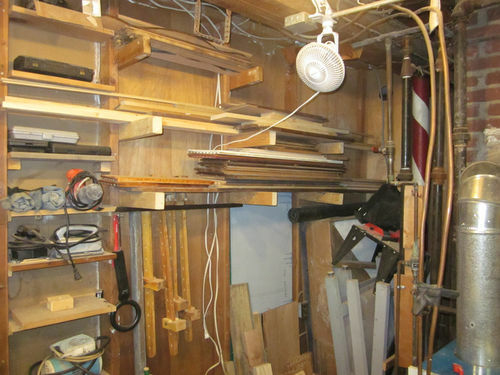 My workshop is an approximately 13×13 foot space in our basement. I’ve begun working on organizing things, but I get things done. The space is multi purpose and part aisleway to the back door and laundry room, so I have to keep things put away as much as possible. In the summer I sometimes adopt our patio under a shade tent to do much of the sanding or larger projects like the trio of Adirondack chairs ala Norm Abram. 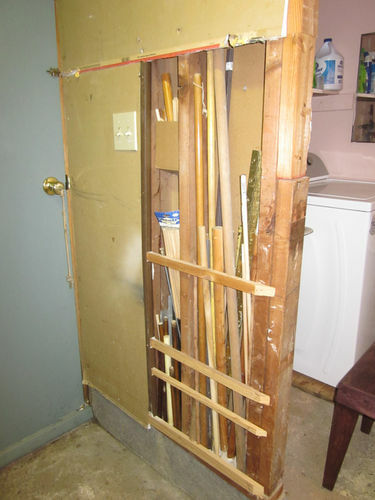 [Above] I built this small, rudimentary wood rack for storing wood which I buy to build projects. It will hold wood that is 8 feet long. As you can see, at the moment it’s mostly being used to store drawer fronts. My drawer side wood resides on the floor along with some useful longer scraps. 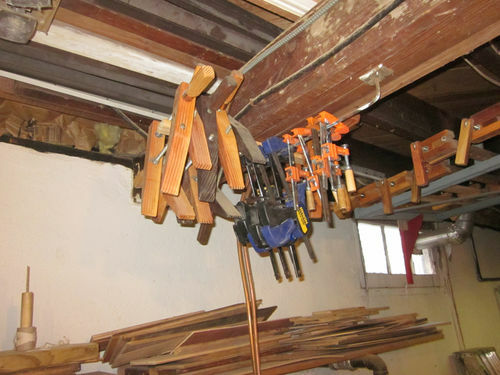 I also store some clamps here. 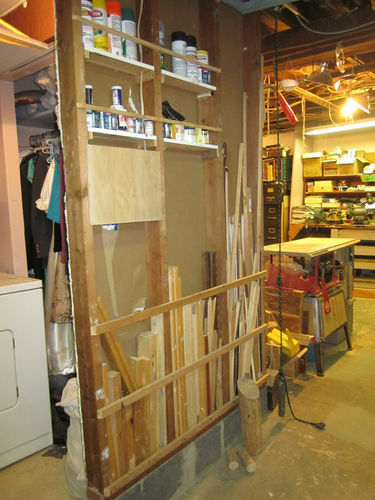 [Above] Outside of the laundry room, next to the outside door I removed some of the wallboard (which I had installed several years before.) I use the space between the studs here to keep ‘round things,’ Dowels, threaded rod, broom handles, etc. [Above] On the other side of the back door is a sort of catch all of misc hardware items and things I think I still need. Tool wise, this is where I keep my brace and bit, my Dremel kit, caulk guns, drop light and a few odd clamps. Most of the boxes contain ‘parts’ for projects I expect to make more of. [Above] On the other side of the doorway to the laundry I have a ‘long’ scrap bin. Most of the pieces are small, but I have found uses for such items occasionally. 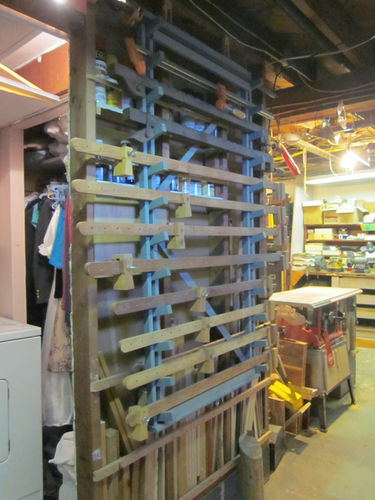 [Below] My ‘disappearing clamp rack’ also swings down to cover the long scrap bin. There’s more about this in this blog entry. 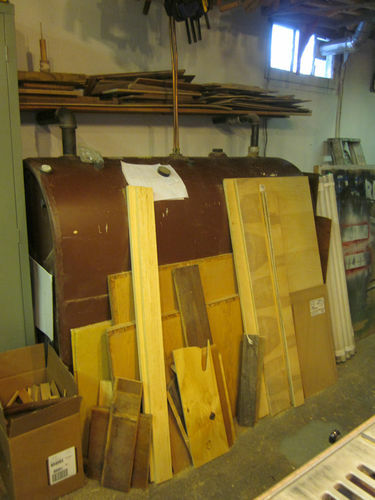 [Below] I keep larger scraps and wood I’m about to use in front of my oil tank. Sometimes it’s tricky keeping the aisle wide enough to please the family. Just above the tank is where I keep much of my plywood scraps. 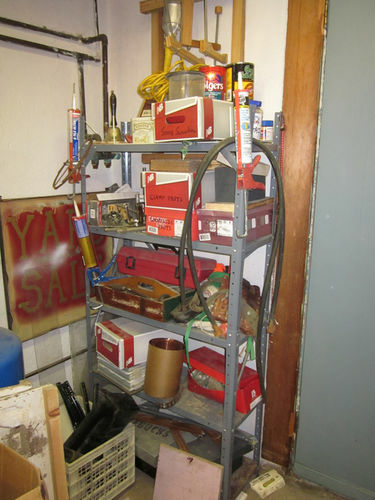 [Below] A bunch of my frequently used clamps are stored near the ceiling above the oil tank. It’s not the very best solution, but it works for now. -- Ni faru ion el ligno! mike, It’s organized in that most things have a place to live. When I get working on a project it quickly turns into a mess. I anticipate increased organization after I build the rolling stands for my DP and BS. All my drill stuff will then be in one cabinet, hand drills, bits, etc. Hey! Nice looking shop! That looks like a garage! Thnx for the tour. Looks like a good area to have some fun. So far the fun has outweighed the frustrations. Dave, you have a nice shop. Congratulations.